The Beach House - Recipe from our Beach House: Crazy For Paella! Recipe from our Beach House: Crazy For Paella! We are so excited about our upcoming Oktoberfest Night Market, taking place at Anchor & Den this Friday, 21 September. 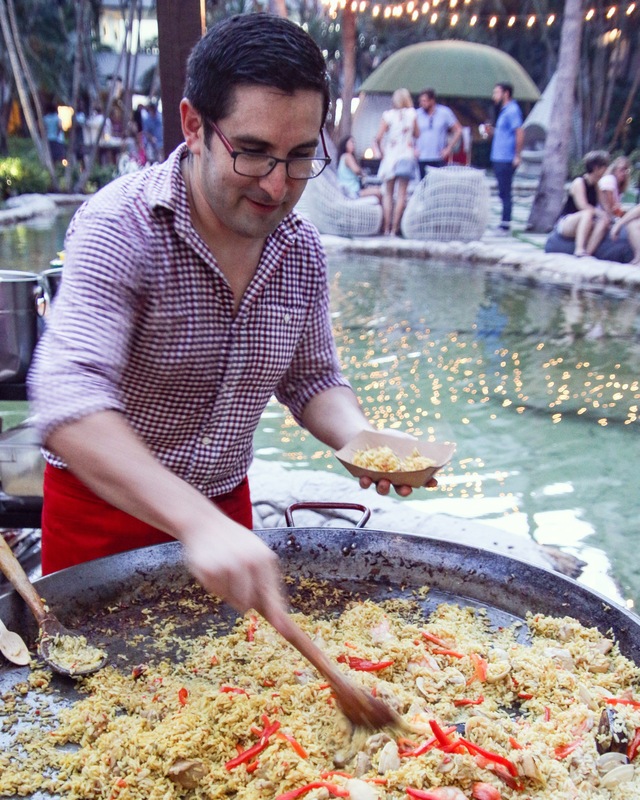 But in the meantime, we are still reliving our foodie fantasies with the delicious Live Paella Station that we had at our Mid-Summer’s Night Market back in July. It was such a popular dish that our guests keep asking us for the recipe. We welcome you to try out this amazing dish at home! Make sure to swing by this Friday to check out the authentic culinary delights that we will be showcasing in the spirit of Oktoberfest! In a paella pan (or a large, deep skillet pan), heat the oil until shimmering. Season the shrimp with salt and pepper and add to the paella pan. Cook over high heat until lightly browned on one side, 2 minutes. Transfer the shrimp to a plate. Reduce the temperature and add the onion, simmering until you see the cubes as crystals, add the garlic and cook for a couple of minutes extra. Increase the temperature again, add the Bomba rice to paella pan and cook, stirring, until it gets opaque, about 2 minutes. Stir in the grated tomato, paprika, and saffron and cook, stirring, until the rice is toasted and sizzling, about 1 minute. Season the chicken with salt and pepper and pepper and add the cubes to the rice. Add the chicken broth and water and bring to a boil over high heat. Boil until the rice is still a bit crunchy and about half of the broth is absorbed, about 10 minutes. Lower the heat, add the mussels and simmer until the rice is nearly tender and the liquid is soupy but slightly reduced, about 8 minutes. Lay the shrimps and red peppers julienne on top. Cover and simmer until the shrimps are cooked through and the rice is tender, about 2 minutes longer.